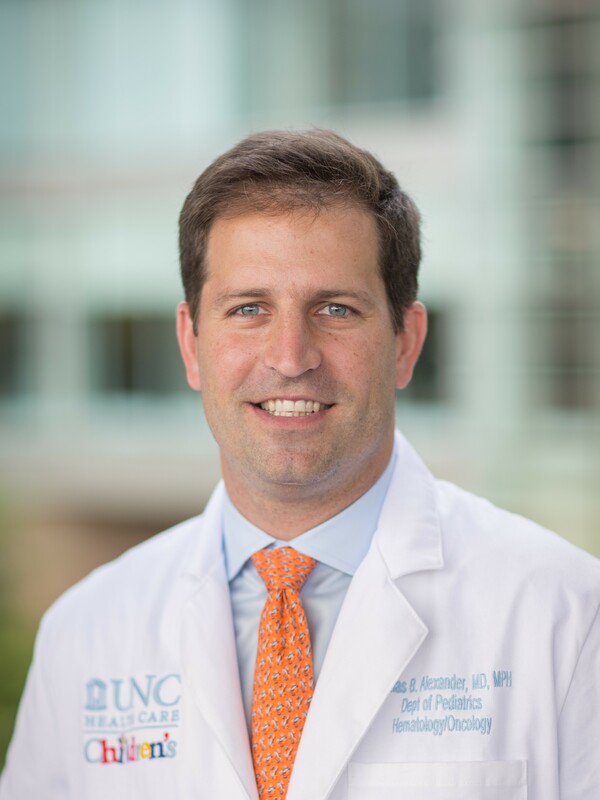 Thomas B. Alexander, MD, MPH, is a UNC Lineberger Comprehensive Cancer Center member and Assistant Professor in the Department of Pediatrics at the University of North Carolina at Chapel Hill. Acquiring a range of skills that will enable me to contribute to translational science of pediatric malignancy is an ongoing process. I have participated in a wide variety of positions which provided the experience and training necessary to develop a solid foundation to achieve these goals. I attended medical school at the University of North Carolina and later decided to study clinical trials and epidemiology while obtaining a Masters in Public Health from UNC. During this time, I spent 18 months as a research assistant developing the study manual and training site staff for an international phase III trial. To continue broad exposure to clinical medicine, I completed four years of training in a combined Pediatric and Internal Medicine residency program at UNC. Subsequently, I decided to pursue a clinical fellowship in Pediatric Hematology/Oncology at St. Jude Children’s Research Hospital. To complement my clinical research training, I chose to focus my fellowship research experience under the guidance of Dr. Charles Mulligan, an international leader in genomics of hematologic malignancies at St. Jude. I have developed laboratory skills while organizing a project exploring biology and outcomes of mixed phenotype acute leukemia. The tools I have acquired of genomic analysis, disease modeling, and pre-clinical testing are invaluable to my future goals. During this period, I have also helped to develop and lead multiple trials for patients with relapsed or refractory AML and ALL. By combining this experience with my broad clinical background, I will work to bring more effective and less toxic medications to children with malignancy through pre-clinical testing and development of early phase clinical trials.